Two years ago, Emma Preston walked away from Jesse Daniels. It is a decision she has regretted ever since. Plagued with the knowledge that Ally’s lies tore them apart, Emma enlists Jesse’s former best friend, Andy, to help her search for him. When he left California, Jesse was determined to start over in West Virginia with his mother. Now, the past is determined to catch up with him—first, with the appearance of Ally, and when Emma and Andy come back into his life. Just when Emma thinks she’s found Jesse, a dark secret and misunderstandings force them apart before they can even reconnect. Jesse is torn between his love for Emma and protecting his childhood friend, Ally. Ally has an agenda of her own, and she’s not about to let Emma get in her way—even if that means getting rid of her… permanently. Can Emma and Jesse’s relationship survive all of their twisted ties? K.A. 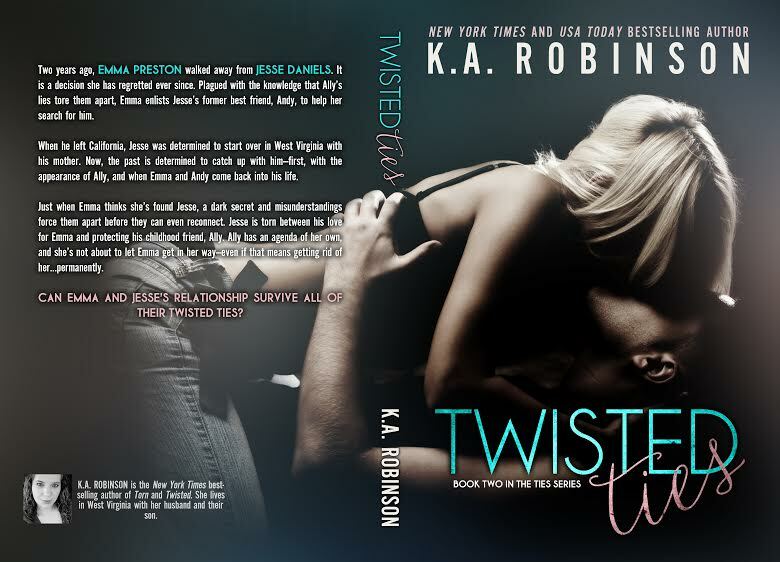 Robinson is the New York Times and USA Today Best Selling Author of The Torn Series and Shattered Ties. She lives in West Virginia with her husband and toddler son. When she isn’t writing, she loves to read dystopian, zombie, and New Adult books. She has an addiction to Caribou and Starbucks coffee.